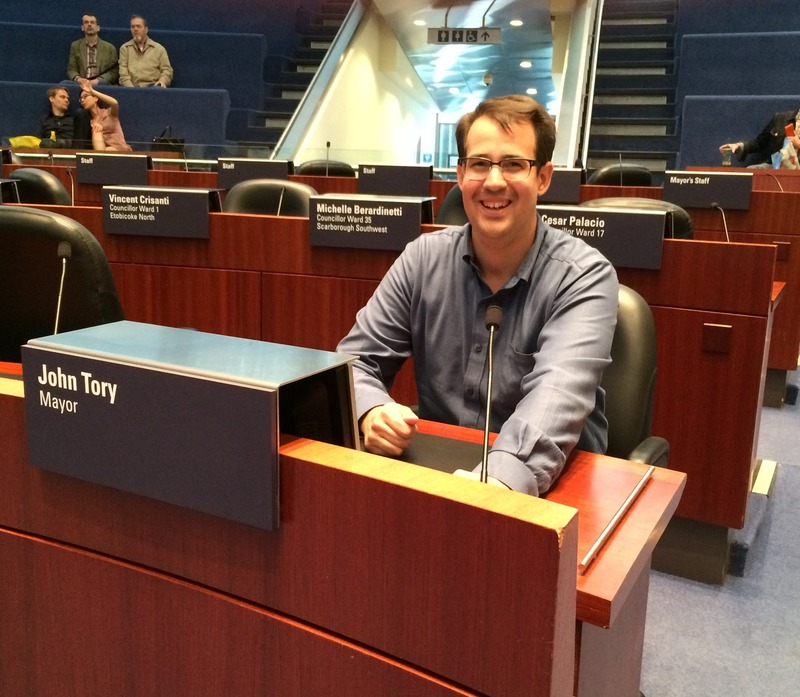 Yes, I think I can do a better job than John Tory! I’ll vote the right way on the racist practice of police carding, I’ll vote for the Scarborough LRT, not the subway, to remove the Gardiner East, among other wise decisions. Until that time, I’ll comment here from the sidelines. I’m a geographer by training, but I’ve long been interested in municipal politics, transit, urban planning and travel. I like long bike rides, but at my own (slow) pace. I grew up in Brampton but now call Downtown Toronto my home. Here is one Scarborough taxpayer’s point of view. I consider taxes a precious resource that should be used in the best interest of the community. The Scarborough Subway extension ridership does not justify the costs of a subway. There is no economic growth prospect that promises to offset the excessive costs of the subway. SmartTrack has not been defined. SmartTrack’s capacity and ridership base are not known. The Mayor’s Director of Policy and Chief of Staff insist that SmartTrack and the Scarborough Subway extension will be implemented. The Mayor is committed to spending taxes on an unknown project and a project that is already excessively costly. What is lost is using precious taxes in the best interest of the community. I fail to understand why the Scarborough Town Centre is considered a critical hub. It happens to be the terminal for the poorly implemented SRT. TTC bus routes serving northeast Scarborough are forced to hub there. GO bus transit serving Durham also hubs there. Since the SRT will be eliminated, both TTC and GO bus hubs can easily be re-located. Alternative hub locations for GO bus would be the terminal of the Sheppard LRT or the Kennedy subway station. Instead of SmartTrack and the Scarborough Subway extension, we should consider an RT (as in the SRT) train running on the surface from Unionville Station Markham to the Scarborough Go Station at Midland Avenue and then a tunnel from Midland Avenue under the Go tracks, surfacing at Queen Street to cross a bridge at the Don River and then into another tunnel under Queen St. to University Ave. The passenger load of this route justifies its cost. Most of the TTC bus routes in Scarborough will be shortened because they only have to travel east/west to get to a RT station (Steeles, Finch, Agincourt, Ellesmere and Lawrence). Currently the bus routes are convoluted to go south to Kennedy or the Town Centre. The additional costs of this route relieve the crush of two problems, the congestion at Yonge/Bloor because of the build up of passengers from continually extending the end points of both Yonge and Bloor subways and the GO Train crisis at Union Station as GO adds more service with insufficient track and platform capacity. This will be the fastest and most convenient route downtown for all of Scarborough and Markham. This is a plan that uses taxes in the best interest of the community. It can be funded with money from the Scarborough Subway extension, Go RER, VivaNext, SmartTrack and the DRP. not really true for the bus routes sir. Yes, the northern bits come down to STC because, well, SRT or not, where else could you make them all terminate? Down to Kennedy is way too far. As far as the crosstown buses most do NOT enter STC at all. Lawrence, Sheppard, even on Ellesmere NO York Mills bus has entered STC. As for your suggestion that ALL E-W routes will terminate at LRT etc etc, I highly doubt it. Right now they All run right through, a couple stop off at SRT but all routes keep going, and when subway or LRT is built these buses, 54,95 etc will continue to go thru as it is not economically feasible to have buses terminate at LRT. Other than 131E what bus routes come down to Kennedy sub anyway? you cannot count the 21 as it is a fairly major N-S route and you cannot count 43 Progress branch as that has been running since 1972 and it’s primary purpose is to serve the industrial Progress area, NOT to serve STC. And the other express routes (190) work great, lmost as fast as subway in some cse..perfect to connect STC with the Fairview area and perfect to connect STC with the Finch Stn area and at minimal cost too. Hi Tony, I’ll contact you off-line. Hi Sean, I’ve enjoyed looking at your election maps and musing about transit/cycling/urban planning in Southern Ontario. Do you have an email where you can be contacted? A colleague ( a frequent commenter on here!) and I are working on a project we think you might be interested in? Hi Vincent! I set up an email address to reach me at.